They left London to follow the dream of life in a historic French chateau and they did it in some style. Chateau de Cormand is 14th century and unlike most of us, looks better for the passing years. I first met Fariba when I was delivering IT training in Clapham, south London. Back then she was running her specialist Persian cuisine catering business. You could say the clues were already there. 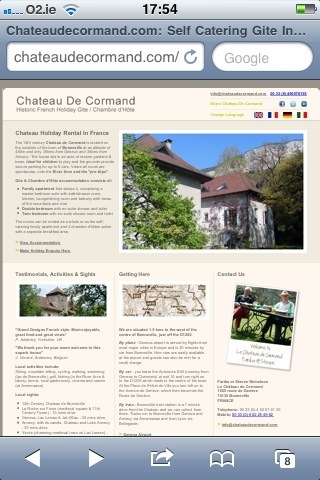 After the big move to France, much hard work and preparation, Chateau de Cormand was ready for the summer of 2011. A website was needed to help get the season started and I was commissioned to do the job. We went for a single page design that would allow for easy translation to other European languages. The site was to have a slide show featuring images of the chateau and its beautiful views. We also incorporated a photo gallery of the guest accommodation. Social sharing links were included to allow visitors to easily share the site on their preferred social network. And what a lot of juicy holiday information there is to share, from local attractions and trips to full contact and booking details. The site has a newsletter sign up facility that integrates with the clickandsend.biz newsletter management application. An email template was developed, matching the look and feel of the website, faciliating Chateau de Cormand branded updates, offers and newsletters by email. The application handles all bounces and allows for full tracking of opens and social sharing on sites such as Twitter and Facebook. The guest accommodation is ready, the site has been signed off and launched. I wish Fariba and her husband Steve all my very best in their new life in France and wish them every success in their self catering gite business venture. I am looking forward to visiting the chateau soon and if you think that you might be interested too then the first step is to visit the website by clicking here Chateau de Cormand. This entry was posted in Work Life and tagged email delivery, email design, email marketing, email template, French self catering gite, web development, Web site design on May 28, 2011 by admin.